The Northern Ontario fishing expedition reached a sad conclusion on Saturday, August 4, as I made it home from Spanish, Ontario, to Cross River, NY, in under 14 hours. I originally headed to Spanish for one week but I didn’t want to leave, so I stayed for an extra week. I hope you will read my glowing review of of The Waterfalls Lodge and look at all the pictures on my Waterfalls Lodge page. Right now, it is time for me to expose the most embarassing moment of my fishing career. Since mid-May, when I planned for this wonderful trip, I looked forward to a chance to go to Northern Ontario for a spectacular wilderness adventure and good living. I had never really driven a boat before, but had watched others do it with envy. I looked forward to a chance to be captain of my own vessel. As I am not an expert on outboard engines (or any engine for that matter), there was concern that pulling the starter cord excessively might give me a heart attack. 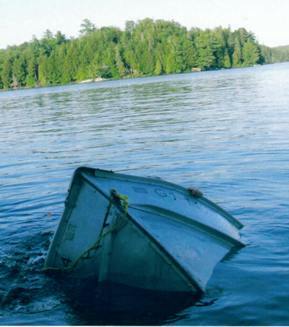 I was also concerned that my graceful foot work in a 16-foot aluminum rowboat might cause a rollover. The owners gave me a “heavier” boat that included a carpeted false floor with a electric starter on the engine. I should have noticed that the bow pointed up at a 45-degree angle when I sat in the stern with the engine. I also did not notice the “notch” in the transom where the outboard engine was mounted. I actually became quite proficient at operating and steering the boat. I decided to head out fishing one night with Wendy, one of the store keepers at the lodge. It was Wendy’s night off and she got her own boat. We headed towards a small cove with a large rock-faced hill that dropped into the water, creating a ledge that bass love. I had caught a nice-sized small mouth bass there the night before. However, as we dropped anchors and started to fish, a local and his high-speed motorboat pulling a large inner tube came whizzing past the point about 60 yards to our east. The ensuing wake pushed me in closer to the rock ledge while Wendy looked like she riding a see-saw (or a teeter-totter for our neighbors across the pond). Then we braced ourselves as the motorboat made a 180-degree turn and head back at us. Despite our waving and yelling, the old fool driving the motorboat passed just 50 yards to our east. Wendy looked like she was riding a roller coaster as the wake lifted her boat out of the water. I was so busy watching her that I did not realize the danger I was in. As the wake hit me, it turned my boat so the the stern was facing the rock ledge which was just about four feet away. As the bow went up and the stern went down from the next wave approaching, the first wave bounced off the rock ledge and over the transom. As I started to reach for my baling bucket, I turned and saw that water was pouring over the notch in the transom of the boat. It has always amazed me how things happen in slow motion during moments of crisis. I knew in an instant that there was no need to panic because the shore was nearby, the water was relatively shallow, the water was warm, my life vest was on and another boat was nearby. I had a weird vision of the Titanic, going down by the stern with the bow pointing up into the air. I just slid into the water as the stern and the engine sunk below my feet. The only thing that I was angry about was that I let go of my fishing pole. The tackle box floated for a few moments, but Wendy was taking pictures and the tackle box sank. I was bobbing up and down just fine in the waves, swimming around and retrieving what I could. We were able to get everything except the tackle box and two fishing poles. The aggravating part was that the idiot pulling the inner tube passed us FOUR MORE TIMES and did not stop despite our waving, whistle blowing and giving them the bird. Wendy guided me to a nearby dock as I held onto the side of the boat. 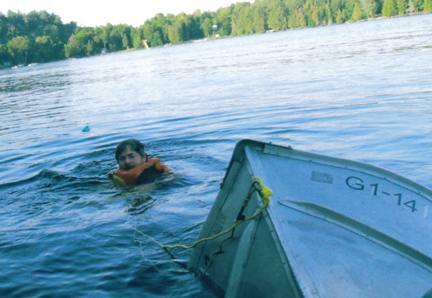 After getting into her boat, we returned to the lodge for help. The good news was that the boat sank in only about 16 feet of water, the measurement based on a 16-foot boat with an outboard motor pointed with its bow sticking up out of the lake. The next good news was that the salvage team from the lodge pulled the boat right out of the water and towed it back. The final piece of good news came the next day when the lodge owner’s son dove down and recovered my tackle box and two fishing poles from the bottom of the lake. When the reckless driver of the motorboat was confronted, he denied that he was driving too fast. He also swore that neither he nor any of his seven passengers saw the capsized boat. They also did not see “Bob” bouncing in the waves wearing an orange safety life jacket. For the remainder of my first week in Northern Ontario, my fellow lodge guests called me “Unsinkable Bob” or just “Bob”. I was cautious from that point on to make sure my feet did not become accidentally entangled in the anchor line, or make any other navigational errors. Please save the comments about “what” floats … but you can call me Bob.